The Siren's Call: This is SO true. I remember when I first moved from Georgia to Alabama. 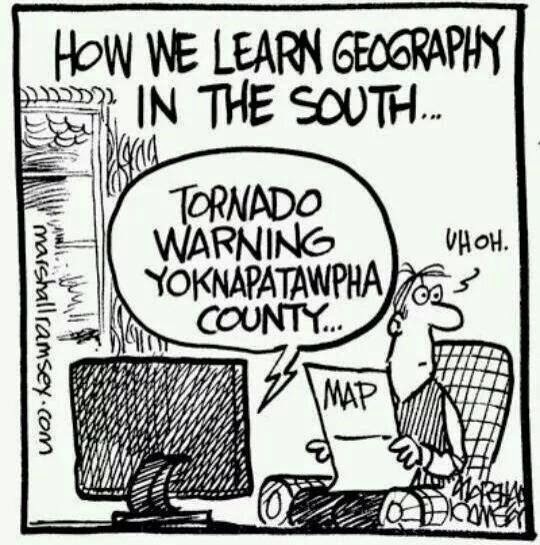 I didn't know any of the counties and of course we were always having tornado warnings in the spring. Fortunately I married a native Alabamian, but I still had to get the map out. When we moved from Alabama to Pennsylvania, one thing we were not expecting to hear was a tornado siren. We were eagerly anticipating snow, but since we moved in August we figured we'd just be enjoying a lovely fall until then. The nights were deliciously cool after the muggy heat of the south, and we were in heaven. Less than a week after we moved, we were awakened in the dead of night by the unmistakable sounds of a tornado siren. Moving on instinct, we leaped out of bed. I threw open the window and, perplexed, gazed out at a perfectly clear and cool night. The weather radio hadn't automatically gone off (even more perplexing) so we turned it on. Breathlessly, we listened to a county by county description of the weather in NEPA. It was uniformly clear and cool. Shortly into the forecast I realized that I had no earthly idea where these counties were and if anything like a tornado were announced, I wouldn't know whether to duck or go back to bed. This is a very uncomfortable feeling in the middle of the night. The siren had stopped by now and we looked at each other. "I guess we'll just go back to bed," one of us ventured. We lay in bed, both still on alert, but eventually went to sleep. The next day Father asked our landlord why the tornado siren had gone off. "Tornado siren?? That's the volunteer fire department siren."